Victoria Lawther is a fourth-year commerce student at Dalhousie who also serves as RBC student ambassador this fall. 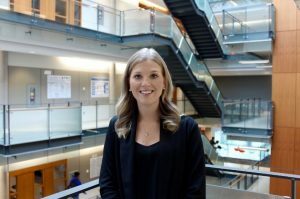 She completed all three of her work terms at RBC where she has built a valuable network of contacts, created a platform to launch her career after graduation, and had the chance to get involved in many charitable and exciting events. RBC and their recruitment team will be on campus Thursday, October 13th for 1-to-1 meetings with students, followed by an information session. If you want to meet individually with a member of the RBC team to discuss what the future might hold for you, email Kelly.Tracey@dal.ca and be sure to check myCareer for additional information.